Sunday's walk at Harrier Meadow has been cancelled as a result of storm damage. These are mostly Sweetgum leaves. They are a host plant for Luna Moth cocoons. 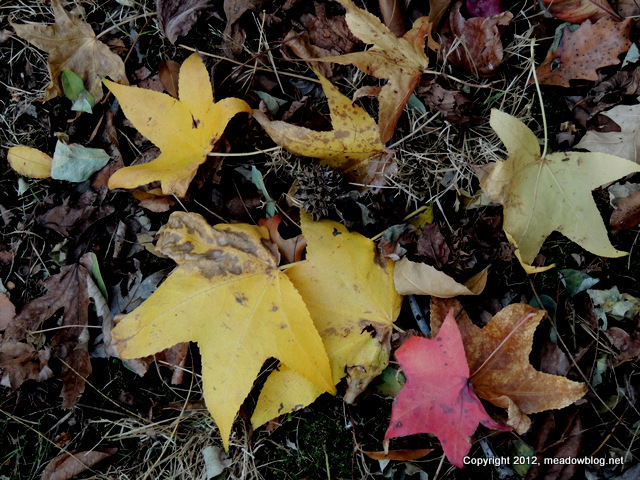 Photographed these leaves at Schmidt's Woods in Secaucus last week. What are they, and what are they a host plant for? The Shorebird Pool at DeKorte Park has lower water levels in anticipation of Hurricane Sandy. Next week, you can call 1-866-927-6416 for possible DeKorte Park closings. 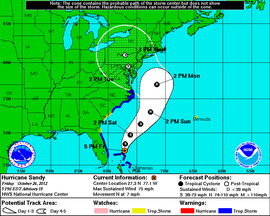 For an eBird article on what birders might see as a result of the storm, click here. Remember: Safety first, always. Our exploratory trip atop the Kingsland Landfill and along the seldom-seen low areas on the other side from Disposal Road yielded a solid 38 species including a Bald Eagle (seen by several) that was too dang far away to photograph. 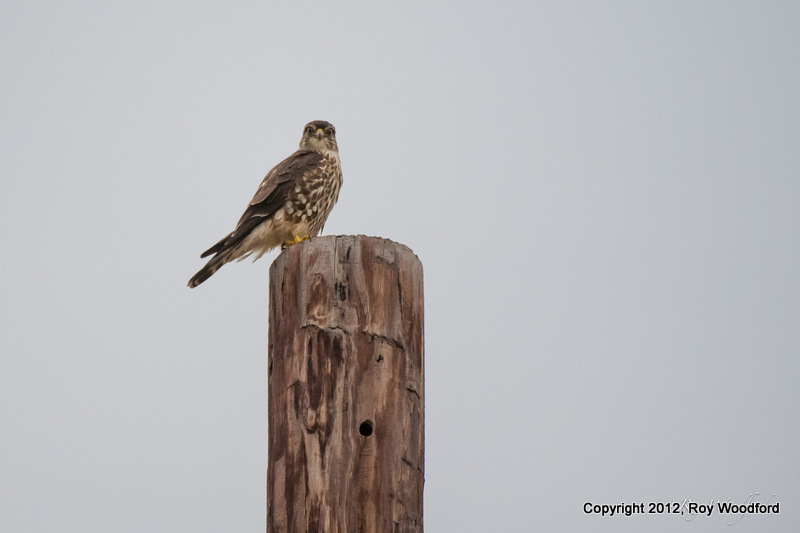 We also saw the above Merlin, which Roy Woodford photographed on Disposal Road — likely still the best way to photograph raptors. Besides keeping this blog and his other duties, the NJMC's Jim Wright writes a twice-monthly column for The South Bergenite. This week's column is about photographer Ron Shields. 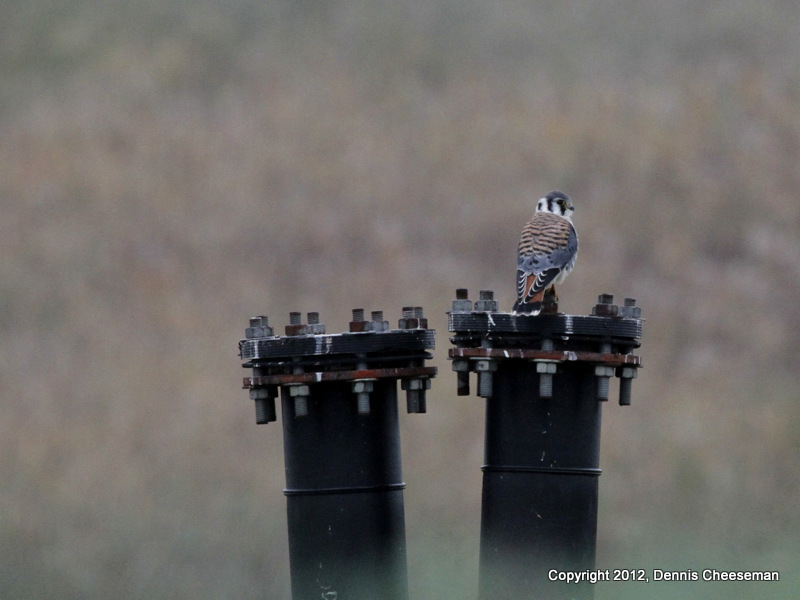 “The Nature of the Meadowlands” was working with photographers the likes of Ron Shields of Kearny. Ron took many of the book’s most memorable images – including an amazing sunrise and a couple of picture-perfect bald eagle shots. 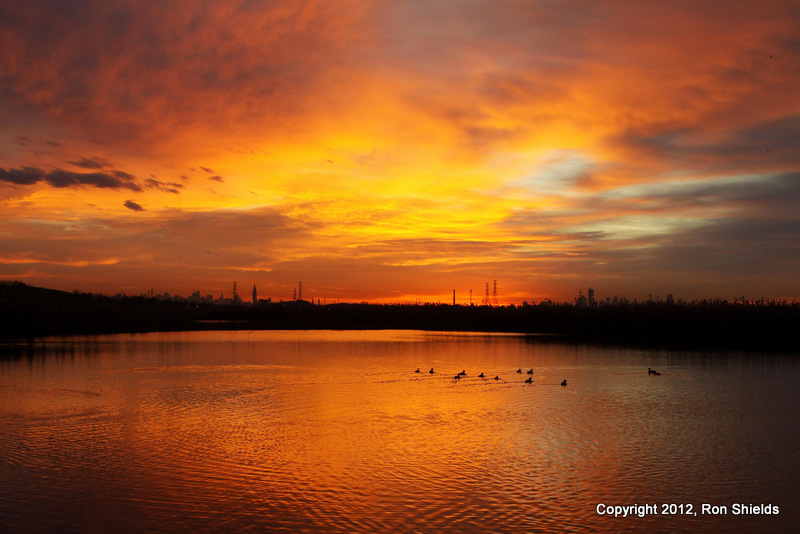 “The attraction of the Meadowlands for me has always been the sense of urban wilderness and isolation one can find here,” says Ron, who is also the principal of Harrison High School. “It’s fascinating to experience the many wonders this area offers while understanding it was once known as the ‘dumps.’ And all of this happens in the shadow of the greatest city in the world. “. Ron’s two favorite places to photograph nature in the district are both open to the public — the Kearny Marsh and a back road called Disposal Road, connecting Lyndhurst and North Arlington. In the warmer months, Ron paddles his kayak into the Kearny Marsh to photograph wildlife without disturbing it. The rest of the column follows. Top o’ Kingsland Guided Event! 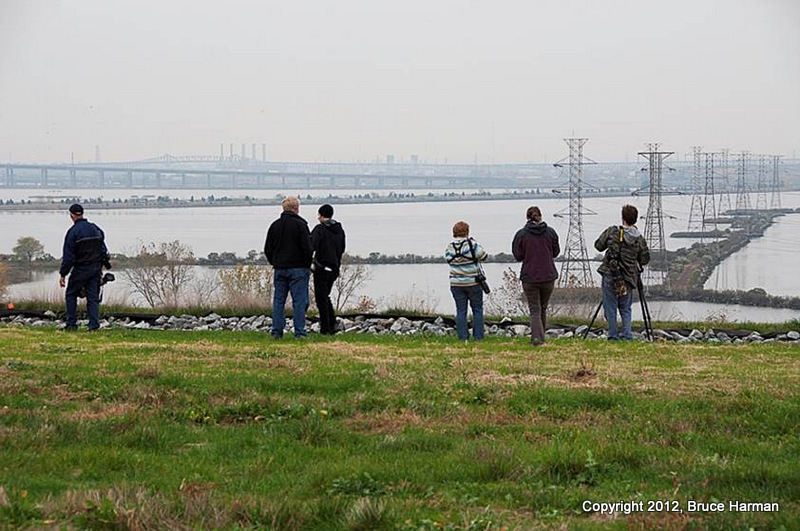 We had a full house for our first-ever birding/photography event atop the closed Kingsland Landfill. We enjoyed the great 360-degree views of the Meadowlands and beyond (photo above by Bruce Harman), and we saw quite a few raptors — though none as close as we would have liked. We will post a full bird list and another pic or two tomorrow if we can. Just a reminder that except for these guided events, the Kingsland landfill is absolutely off-limits to the public for safety reasons! If you see anyone trespassing, call the site's security office at 201-896-8100. 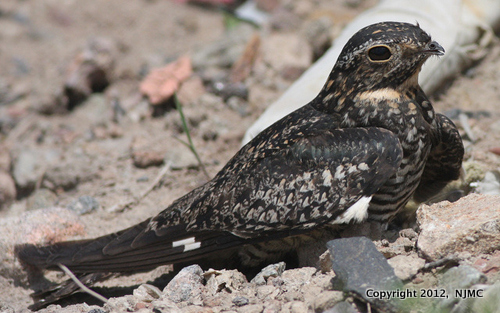 Our latest wildnewjersey.tv blog post features photos of a Common Nighthawk from the old Kingsland Landfill, a stand of White Cedars and a Black saddlebags — all featured in our new book, "The Nature of the Meadowlands." NJMC Naturalist Emeritus Don Smith reports seeing a Red-throated Loon on Mehrhof Pond in Little Ferry this morning. You'll need a scope and look through the chainlink fence — it's toward the back of the pond. To get to Mehrhof Pond, follow the directions to Losen Slote Park on the left-side of blog, but go straight for a block or so past the turn for the DPW.